Navigator of the Seas takes a simple approach to dining, while offering a handful of specialty restaurants to satisfy different cravings. There's one dining room, where passengers can choose to either have dinner when they wish or at a set time; a traditional-style buffet and a cafe that serves complimentary coffee and snacks around the clock. Where the dining quality and variety truly stands out on Navigator is in its specialty restaurants, which range from a cozy yet chic, New England-style seafood eatery to an edgy, Japanese street art-themed sushi bar to a more communal gastropub-style joint that serves savory comfort foods. The catch: Seven out of eight of them cost extra. Most of these restaurants also are open for lunch or snacks (usually for less money) throughout the day, so you don't have to wait until dinner to treat your taste buds. Gluten-free bread and other foods catering to special dietary needs are available at every restaurant; gluten-free, vegetarian and vegan items are marked on menus, but you can always ask if you don't see something. Navigator of the Seas' Main Dining Room takes up prime real estate at the back of the ship. The three-deck venue is where passengers can enjoy nightly dinner free of charge -- opting for either My Time Dining (during which you can walk in and be seated whenever you want, between 5:30 and 9:30 p.m.) or traditional dining (where you sit at the same table, with the same wait staff, at 6 or 8:30 p.m. every night). Reservations are required for those who opt for My Time Dining. The dinner menu includes starters like beef carpaccio, French onion soup, escargot and an iceberg wedge salad; main courses such as almond-crusted cod, duck a l'orange, vegetable casserole and your usual classics like chicken breast and steak; and desserts that range from carrot cake and sugar-free peach shortcake, to souffle and creme brulee. 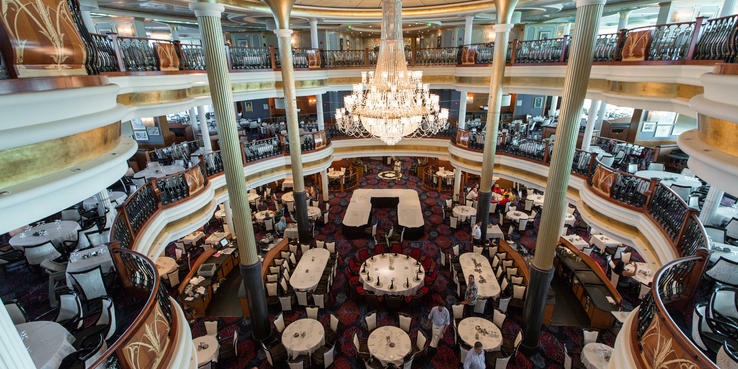 For an added fee, you can select one of three "Premium Selections," including Maine lobster, filet mignon from the ship's Chops Grille steakhouse, and surf and turf. Navigator of the Seas' dedicated buffet is arguably the most convenient spot for a meal, as it is open throughout the day -- beginning with an "early riser" breakfast and ending with late-night snacks till midnight. For lunch and dinner, you'll find the basics such as a variety of sandwiches, pasta dishes and meats from a carving station. There's a bar that also serves Illy coffee, as soon as you walk in. Seating arrangements, including tables, booths and a few larger, round booths, are plentiful. You can't miss this bright, colorful Mexican eatery on the pool deck. Its fiesta-inspired decor and ample seating along the windows lure in passengers for breakfast, lunch and dinner (although the latter two meals are considered "snacks" on the daily planner). Because of this outdoor venue's casual vibe and proximity to the pool, it tends to draw a lot of families. For those who want only a quick bite, Navigator of the Seas' Cafe Promenade is open 24 hours a day. Conveniently positioned in the Royal Promenade, this casual cafe serves complimentary coffee and snacks (not substantial enough for a meal) and is a great place to relax for a moment and soak up all the Royal Promenade action. Another great date-night option, Hooked -- the ship's dedicated seafood restaurant -- welcomes diners with a cozy, chic design that offers a nod to greasy pole (a contest that takes place every year in Gloucester, Massachusetts, and other places around the world). Menu items run the gamut from raw oysters and other shellfish specialties to fresh fish cooked any way you want it. During lunchtime, a smaller menu can be enjoyed for $19.99. Comfort foods such as wings, pork sliders and burgers are available at this sports bar during lunch and dinner hours. Those looking for a light lunch or appetizers before dinner can munch on seafood bites such as ahi tuna poke, Tahitian coconut crab bruschetta and Asian noodle salad. Royal Caribbean's signature steakhouse, Chops Grille, is an enclosed venue located within the Windjammer buffet on Navigator of the Seas. It's a quiet, romantic space perfect for date nights and serves steakhouse classics (think several cuts of steak, lamb and seafood dishes) with a variety of sides from which to choose. An abbreviated menu is available for lunch and comes with a $21.99 surcharge. Italian food with an innovative twist is the best way to describe the menu at Jamie's Italian, a Royal Caribbean favorite tucked away in Navigator of the Seas' Windjammer buffet as its own space. Standout dishes include a cured meats plank, marinated eggplant Parmesan "steak," and truffle tagliatelle -- all presented in unique ways. Choose from several sides, and make sure to save room for dessert. Limited items are available at lunchtime for $19.99. Craving Asian cuisine? Head to Izumi, the line's signature Japanese fusion restaurant, for an assortment of starters, sushi rolls, bowls and even the chance to cook your own meal on hot rocks (which also makes for a fun photo op). For coffee connoisseurs, or those who simply want more options than what's offered in Cafe Promenade, there is a Starbucks that serves specialty coffee and other signature Starbucks drinks, as well as treats, throughout the day. One of two poolside dining options, Johnny Rockets Express serves a variety of burgers and hot dogs, chicken tenders and a chili bowl -- all of which can be paired with soft drinks, regular milk shakes or spiked "adult shakes." Twenty-four-hour room service is available, and all orders, except continental breakfast or those made by passengers staying in Grand Suites or above, incur a $7.95 fee.